[in pencil] This design will be printed on different [illegible ?sorts] of earthenware. 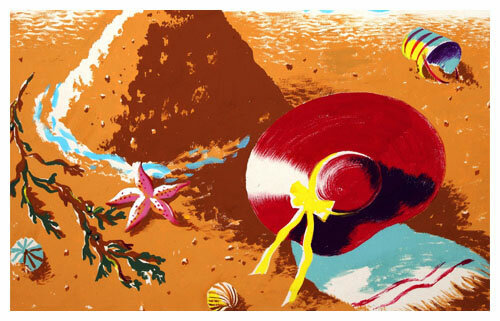 An early [illegible] will oblige. 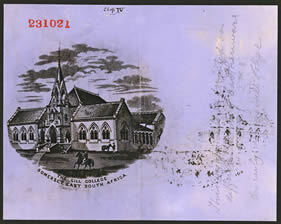 This commemorative design seems to have been prepared to mark the founding in 1869 of Gill College in Somerset East, Eastern Cape Province, South Africa. The college takes its name from the bequest of a local farmer and surgeon, Dr William Gill, who had died in 1863. He was born in 1792 in Market Harborough, Leicestershire, studied medicine at Glasgow University and emigrated to South Africa. He settled in Somerset and devoted himself to medicine, farming and community development. The college is now a private school. Other examples of this plate bear the mark of the Kilnhurst Pottery, Rawmarsh, South Yorkshire.